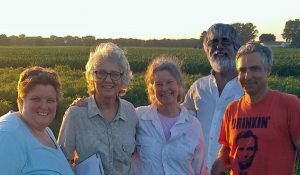 A signature project of the Green Sanctuary committee is the creation and maintenance of a Prairie Garden with native vegetation. The ALUUC prairie was established in 2009 with the help of a grant from the Illinois Native Plant Society and the sweat equity of many ALUUC members. The prairie is about 36,000 square feet, nearly an acre. 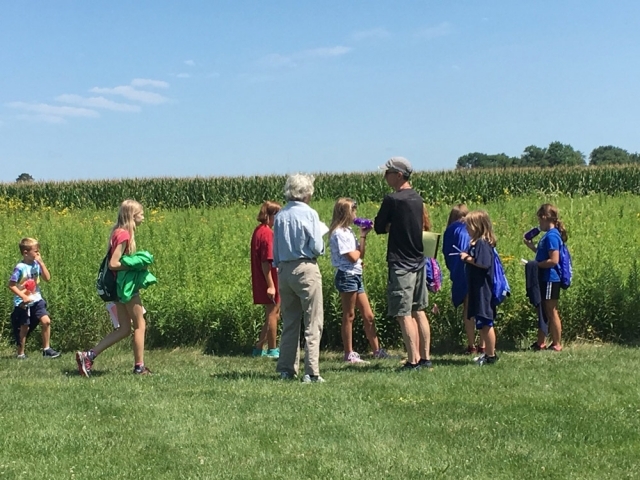 The ALUUC Prairie Garden provides a reduced carbon footprint, increased wildlife habitat, educational resources, seasonal altar flowers, space for contemplation, seed source, minimal maintenance, and no mowing! Plants include: nodding wild onion, blazing star, black-eyed Susans, purple coneflowers, penstemons, prairie dock, and compass plant. 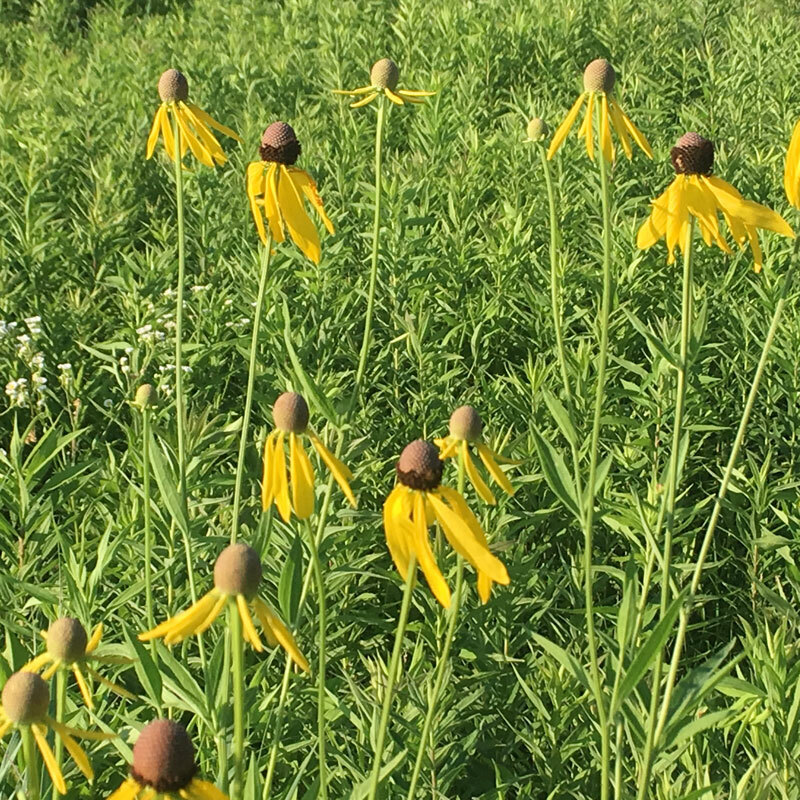 Adopt a prairie plot and learn about native plants! 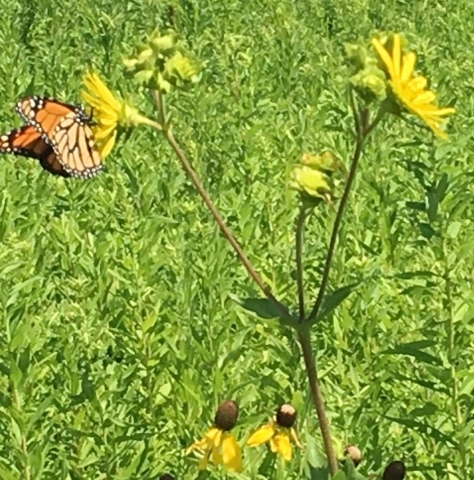 Last year the ALUUC prairie was a haven for many different kinds of butterflies, native bees, dragonflies, birds and a variety of native plants. You can have a deeper experience of this prairie by adopting a small plot of the prairie to care for this coming year. 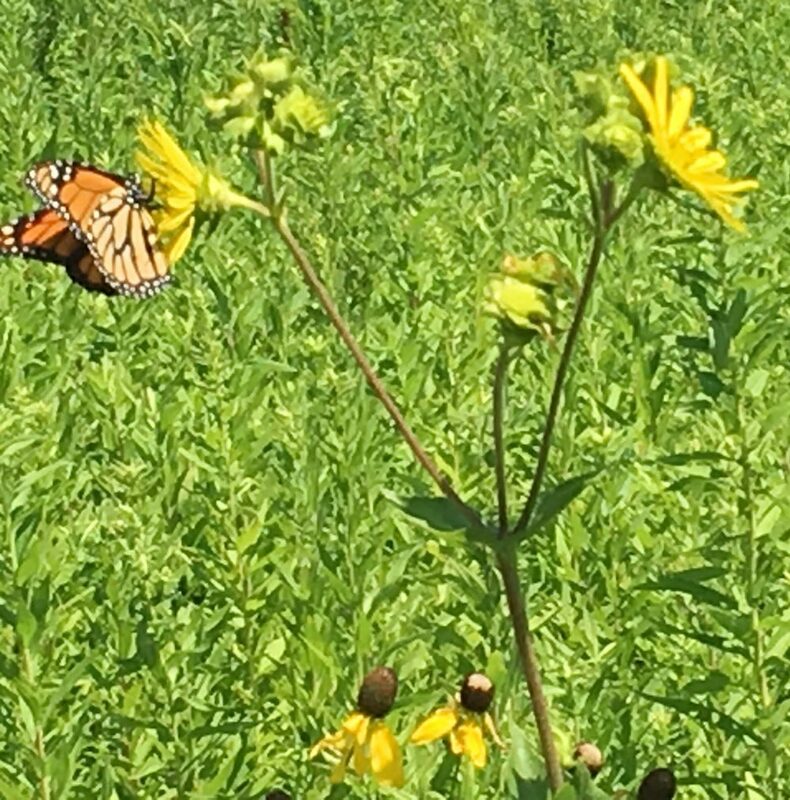 This spring the Green Committee will introduce new species of plants to the prairie to further increase its beauty and increase habitat for the many butterflies and other insects that pollinate plants. You can be a part of this effort by adopting a one of a limited number of plots where new plants will be planted. (Funding is limited so the number of plants will be limited.). Or, if you don’t like to plant plants, plots are available for weeding so the native plants already established will flourish. What does adopting a prairie plot entail? 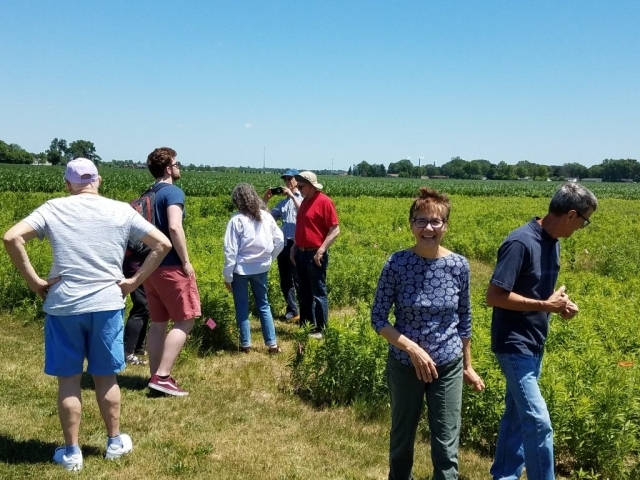 Best of all, there are two highly qualified members of our congregation, UIS professor of ecology, Dr. Amy McEuen and Lincoln Land ecology professor Becky Croteau who will mentor you in plant identification and prairie ecology. Each plot will be 10 feet by 10 feet, although the plots can be smaller if that size is too large. Planting will begin May 11and Green Committee members will be available to answer questions about planting. Care of the plots will end in September and can be at times convenient for you. The committee recommends two people per plot—two people are more fun than one, and also the work can be shared. New plants will have to be watered once or twice a week until established unless there is sufficient rain. There is a spigot at the garage and a hose and buckets will be provided. Weeding—yes weeding. The Green Committee will provide straw for mulching to cut down on the weeding. 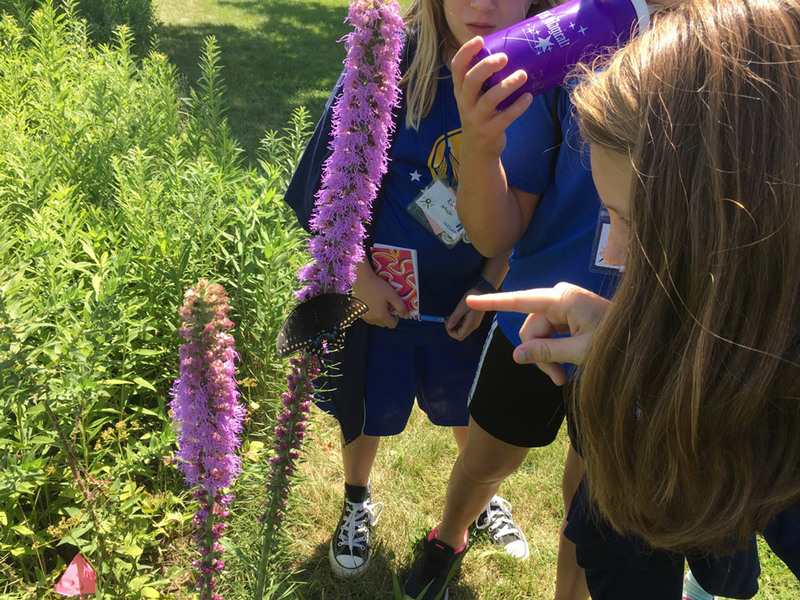 Mentors will help identify native plants that are keepers and weeds that have to be removed. Other ways to become involved with the prairie are to photograph blooming plants and/or insects and other wildlife through the season or simply record their presence in a prairie journal that we can start. If you are interested, contact Virginia Forrer or other members of the Green Committee. A number of plots have been spoken for, so now is the time to sign up. Creation of a new prairie walking path is in progress, led by Ryan Croteau as an Eagle Scout Project, with support from Green Sanctuary. A walking path has been created. Specific plant species have been identified and marked with numbered flags. A meditation circle is planned for the middle of the path, with concrete benches that can withstand periodic burning. Also planned is a sign at entrance, as well as signs labeled with plant names. 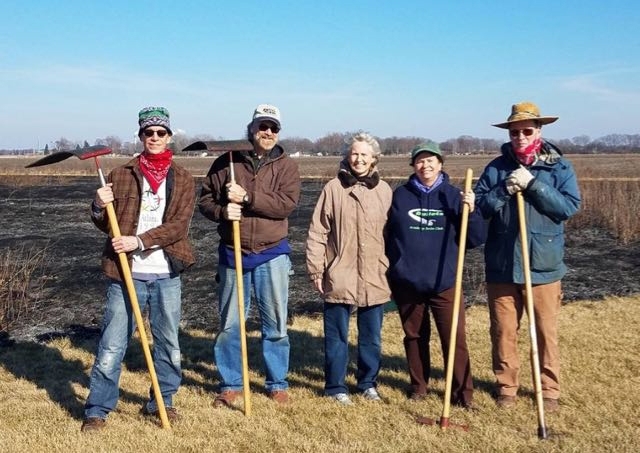 Covenant group members Anna Sabin, Virginia Forrer, Carol Kneedler, Greg Greeley, and Tony Gambiani worked on the prairie for their service project. To fulfill their commitment of completing a service project for ALUUC, the Sunday Covenant Group spent an evening working in the ALUUC prairie. Greg Greeley, Anna Sabin and Virginia Forrer numbered the flags, marking and photographing special plants along the newly created path. The photographs will provide a photographic history of the prairie that can help track changes in the prairie over time. 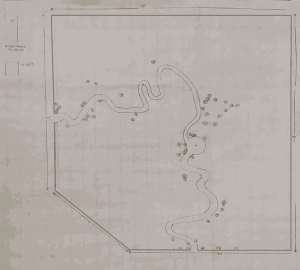 Carol Kneedler and Tony Gambiani plotted out the prairie and made an amazing map of the newly created trail noting the placement of the numbered flags—another way of documenting changes. It was a wonderful evening— –not too hot with members feeling a sense of accomplishment and camaraderie that comes from working together. Herbicide spraying to control large infestations of invasive non-native plants – in the spring of 2018, five members took herbicide application training so they are certified to properly and safely apply herbicide to invasive plants in prairie that are too numerous to remove by pulling. 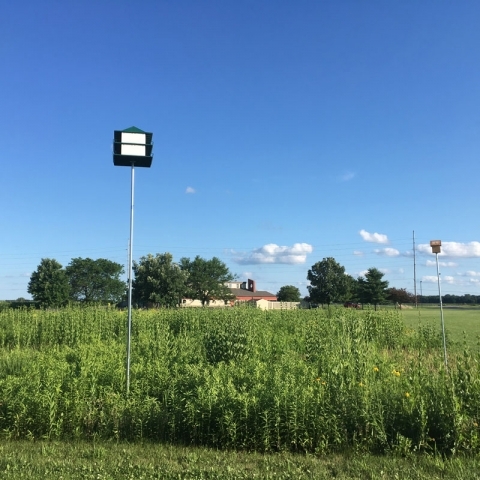 In December, of 2009, the Green Sanctuary Committee, represented by Becky Croteau and Meg Evans, provided a presentation proposing that a prairie restoration area be created on the church property that was left un-mowed the previous summer. Becky is a plant ecologist and has created these spaces elsewhere, including at Lincoln Land Community College. 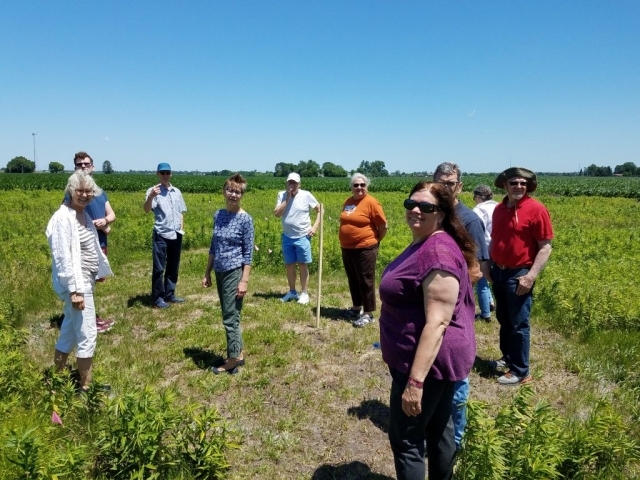 Becky secured a grant from the Illinois Native Plant Society to assist with expenses for the restoration. There was a Sunday service on the prairie on February 7, 2010. The ALUUC Prairie is under continued evolution. With the encroachment of lawn grasses we have received the help of Brian Hidden, Biologist with the U.S. 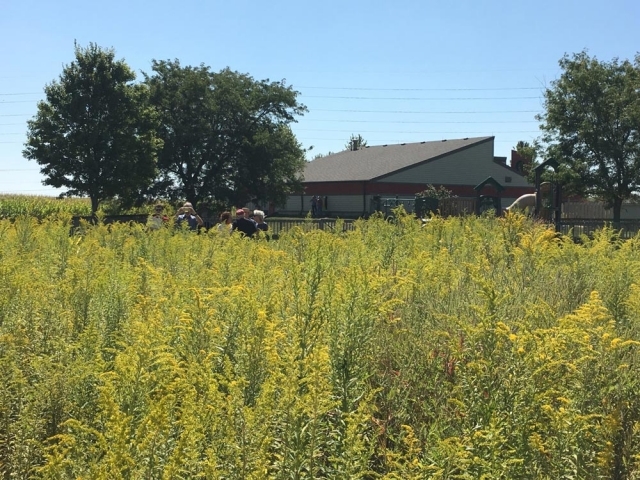 Fish and Wildlife Service, to tackle the more difficult grass and goldenrod encroachment on our prairie. 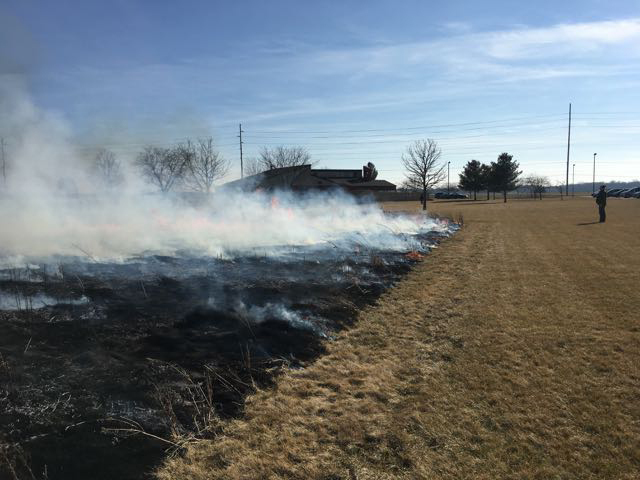 The Prairie was able to be burned off last month but the aggressiveness of the grasses calls for additional help. Jim Curran, Larry Muir, Dave Cation and Jim Custer took a course in Herbicide Application from Vern LaGesse to help with applying herbicides to the invasive problem plants under Virginia’s license when needed. 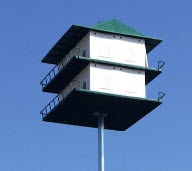 Thanks to David Cation, who obtained the purple martin house; Jim Curran, Jim Custer and David who set the concrete and post; Larry Muir and Bob Croteau and others who helped put it together – the prairie now has a new residential building on it and hopefully it will soon have a high density Purple Martin population. It sports a great view from its patio decks and must have a large fireplace judging from the size of the chimney. On the menu is an all-you-can-eat mosquito buffet. We found many treasures amongst the goldenrod last night! I am very encouraged to see the perennial native plants starting to get a better foothold. I would also like to express my gratitude to the students from Lincoln Land Community College who came out to help. They did a great job! We dug out sixteen ornamental plum trees and one Bradford Pear, all carried in by the birds. We also removed the only thistle we could find. Then we cleared several dozen square yards of common goldenrod. 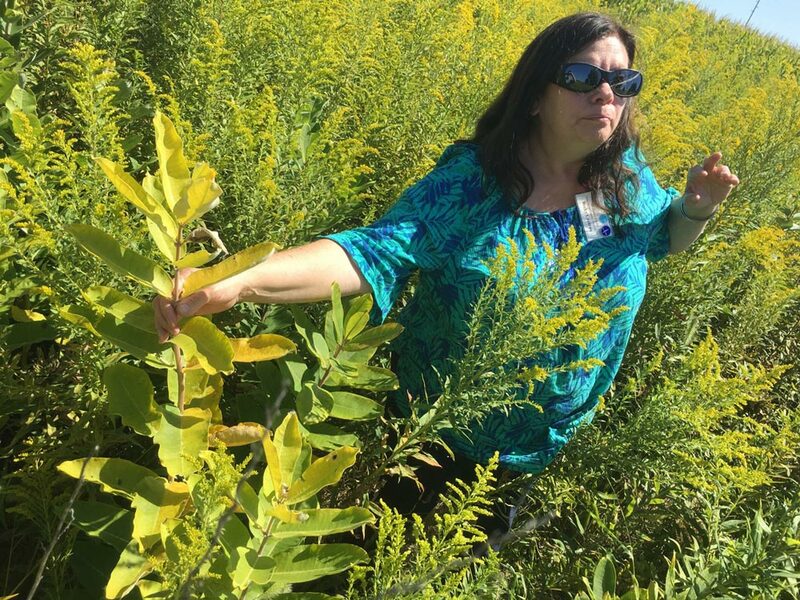 We are reducing the goldenrod population to encourage the native perennials. There is a lot more work to be done. If you would like to help, contact Becky Croteau by phone or by text. She will add you to the Prairie People contact list. 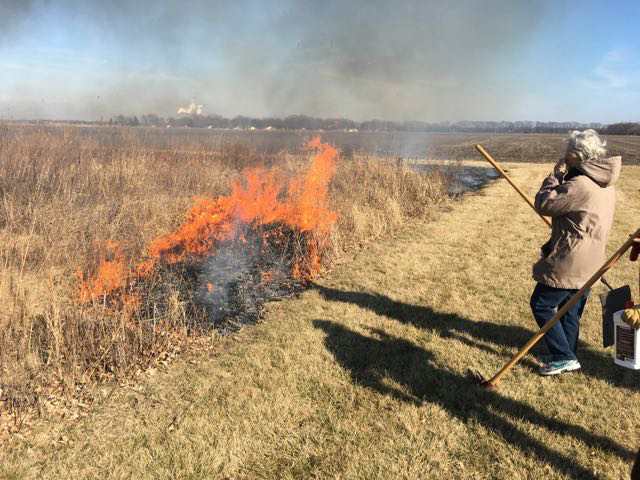 The Green Sanctuary Committee burned the ALUUC prairie the first Sunday in February. What a blaze! Flames over 5 feet tall—for maybe 10 minutes. 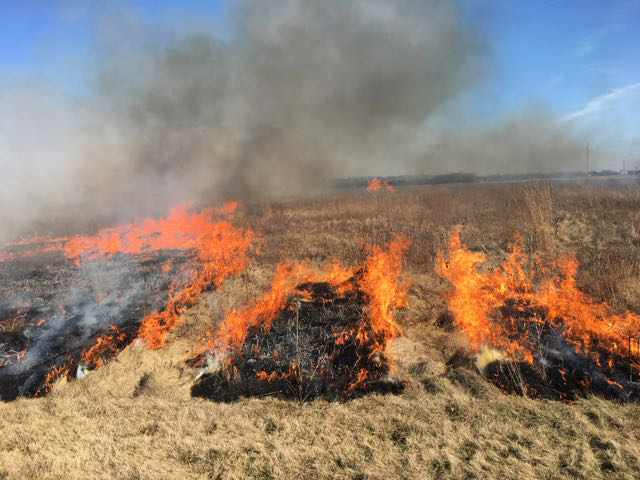 These burns have to be conducted with care using equipment and training that have been developed over years of experience with prairie burning. So why burn? Before Europeans arrived in the U.S., native people routinely burned the prairies to stimulate growth of new plants for game and to make hunting easier. Lightning also set prairies ablaze. Over thousands of years, prairie plants adapted to these fires—sending roots deep into the earth to protect against both drought and fires. 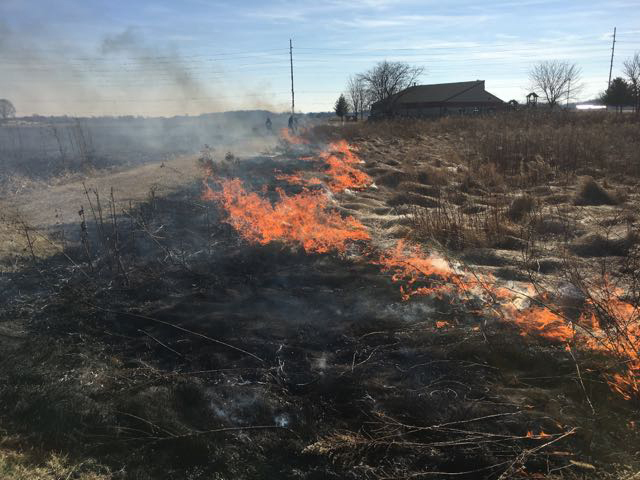 Fires can kill less adapted plants such as cool season grasses and some shrubby plants that can take over the prairie. 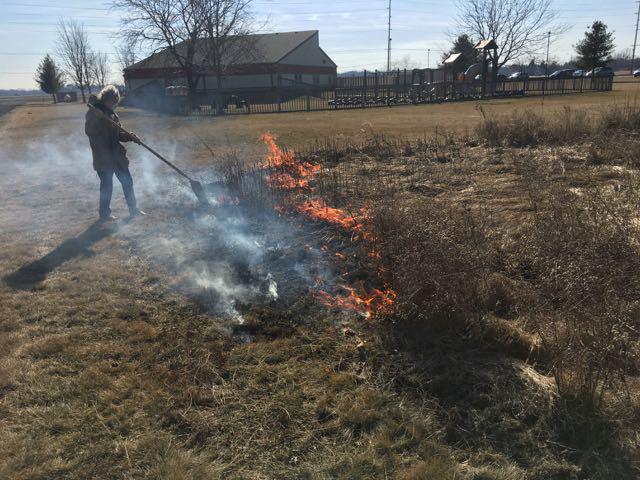 So we burn for the same reason—to rid the area of last year’s growth, stimulate new growth and rid the prairie of undesirable plants such as cool season grasses. A common concern is that burning releases carbon into the air adding to global warming. True, burning does release carbon into the air—but this carbon is “new” carbon that has been circulating in the air in the last few years—not “old” carbon sequestered millions of years ago in the coal and oil we now burn. Because of their deep roots, prairie plants sequester more carbon in their roots than released in a burn, even in prairies burned every year. So in balance, prairie plants are a carbon sink. (Chris Helzer, Nature Conservancy’s Director of Science in Nebraska). September and October in the prairie is the time for asters and goldenrods. Looking out, one sees gorgeous yellows, purples and whites. Here are butterflies (probably two cloudless sulphurs) nectaring on New England Asters. We also saw honey bees, bumble bees, a skipper (probably a fiery skipper) and a cute little fly with a long proboscis called a bee fly on the New England Asters as well. 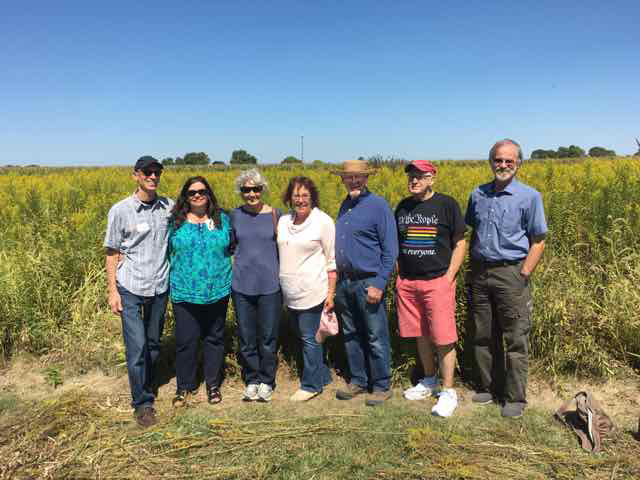 On a beautiful September Sunday, Larry Muir and Virginia Forrer joined Vern LaGesse and the Friends of the Sangamon Valley to collect Rosin Weed and Sweet Black Eyed Susan seed at Nipper Wildlife Sanctuary. Some of these seeds will be added to the ALUUC prairie to add more color and diversity. For those who are not aware, the ALUUC prairie is just north of the church playground. Take some time and go out and see what is blooming. Prairie fact: Prairie (not lawn grass) can sequester as much carbon as a forest. * Most of it is underground in the prairie plants’ deep root systems (up to 15 feet). So ALUUC is making an important contribution to combating climate change. Thank you to those who helped collect seeds at Nipper Wildlife Sanctuary. Their work resulted in several big bags of seed from flowers such as penstemon, monarda, and grey headed coneflower. Many of those seeds will go into our prairie to enrich its diversity. Also, a big thank you to the Men’s Group for whacking all the giant ragweed on the northern property boundary. Here they are (minus Jim Curran who took the photograph) in the midst of the vanquished foe. Ragweed, and not goldenrod, is one of the main causes of sneezes in the fall and considered a noxious weed. 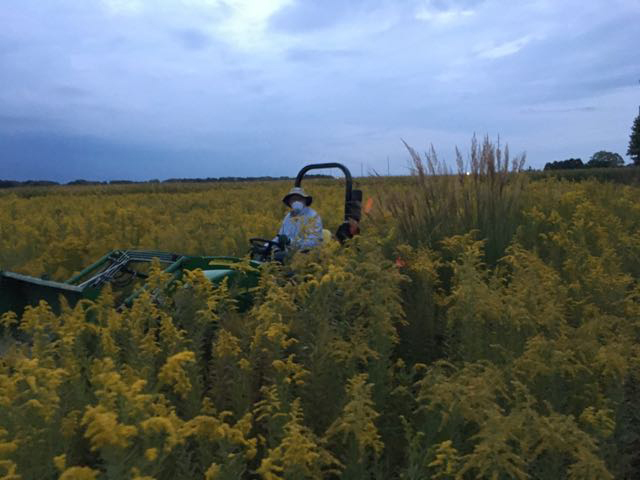 Although this ragweed was not in the prairie, it was a potential seed source for our prairie, and we are glad it is gone. 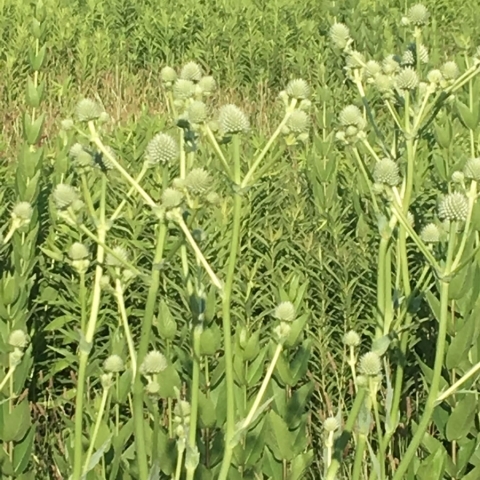 The flowers already present in the prairie are attracting many pollinators. Here is a Buckeye butterfly, one of several species of butterflies that can be found in our prairie. The Buckeye immigrates up from the south to our area in the spring then can be found in open sunny areas, old fields and roadsides—not an uncommon butterfly but important as it flies flower to flower transferring pollen while feeding on nectar. I’ve talked to several experts who manage natural areas and they say this year they see fewer butterflies than in previous years. 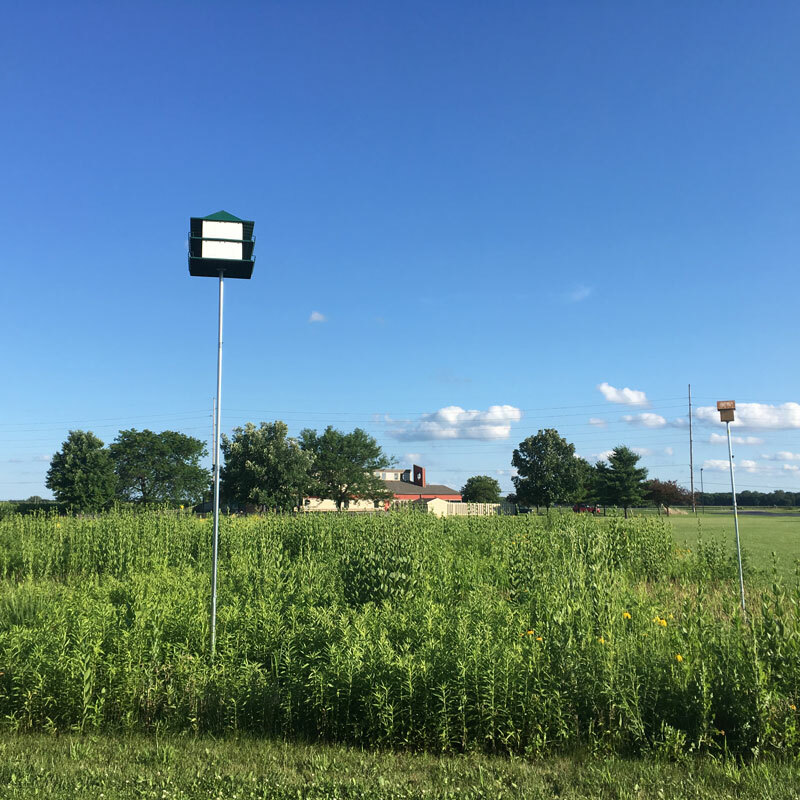 So our little ALUUC prairie, especially as it matures, will provide food and habitat—increasingly limited resources—for butterflies and other pollinators. Besides, butterflies are so beautiful they bring joy and wonder just by being present. Gardeners are used to near immediate results when they paint their yardly canvases with already potted plants or seedlings that burst into color even as they are going in. Even planting seeds directly in the soil yields quick results as they enter the annual race to beat the competition for sunlight. So it may not seem like the prairie is doing as well as it should from those expectations. However, according to Prairie Restoration Expert Vern LaGesse, the prairie is coming along very well. In a recent visit to check on its progress he pointed out numerous sproutings to the dedicated nurturers Becky, Virginia and Meg who braved the rain for the prognosis. The prairies were built over thousands of years so patience should be exercised when trying to reestablish one on depleted farmland, surrounded by modern agribusiness. Soon much of the persistent lawn grass will be completely displaced by the new carpet of prairie flowers and grasses. We get to watch it grow like our children into a full mature participant on planet Earth. The prairie is right on schedule! First, we are seeing dandelions, goldenrod and other pioneer plants–plants that have evolved over time to take advantage of disturbed soils. Sometimes we call them weeds, because we don’t want them in our gardens, but they are filling a special role in nature by colonizing bare or empty ground. This past summer, we dug out some non-native, invasive pioneers like thistles and sweet clover, so they will not be an ongoing problem. As time passes, we will see nature taking its course as more prairie plants that need less disturbed soil begin to flourish. 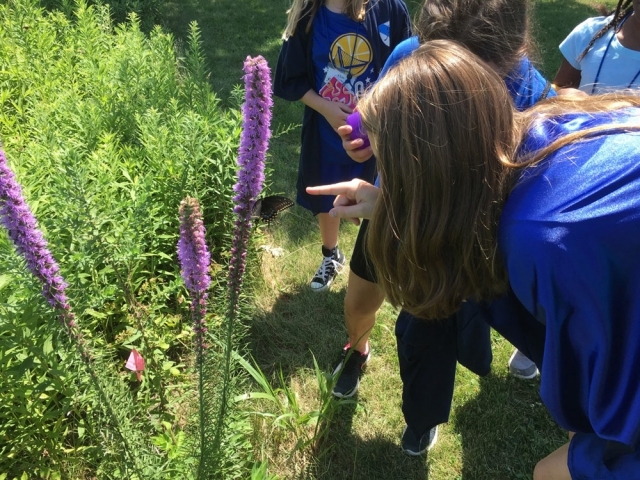 Already we are seeing many prairie species bloom, including nodding wild onion, blazing star, black eyed Susans, purple coneflowers, and penstemons. Donated root stock of several more flowering species was planted last spring and a few more will be added this fall. Some seeds did not germinate last year, because it was too dry. So, they bided their time until more favorable conditions and began to sprout this year. These are plants like prairie dock and compass plant that are present but will take several years to bloom. They are sending their roots deep into the earth—sometimes eight feet or more. In the next several years, six feet shoots with pretty yellow flowers will grace the summer landscape. 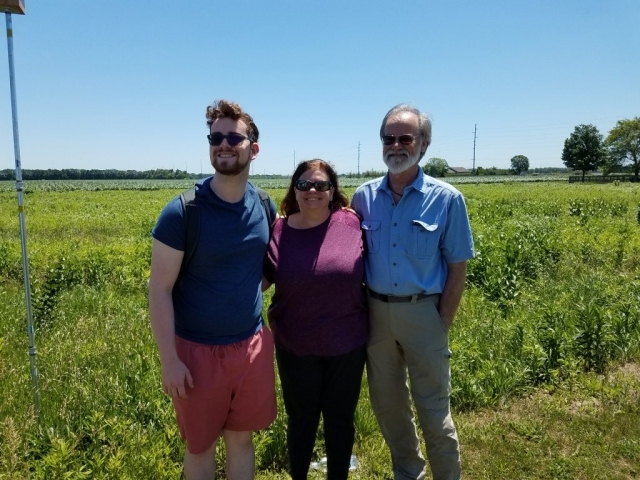 Many prairie plants have these extremely deep roots, which over thousands of years—by their living and dying–have helped make Illinois soil one of the most fertile soils in the world. Deep roots are an adaptation to fire, which Native Americans periodically set to freshen the prairie grasses for game. Fire is necessary for the maintenance of prairies, killing off less fire adapted species and burning the winter remains of prairie plants. The ash, then, returns nutrients to the soil. This fall or winter, we will provide the same services as the Native Americans by burning off the prairie when the conditions are right. ALUUC members planted this prairie for the many benefits it bestows. Some benefits are practical such as not having to expend gas and time mowing the area now in prairie. 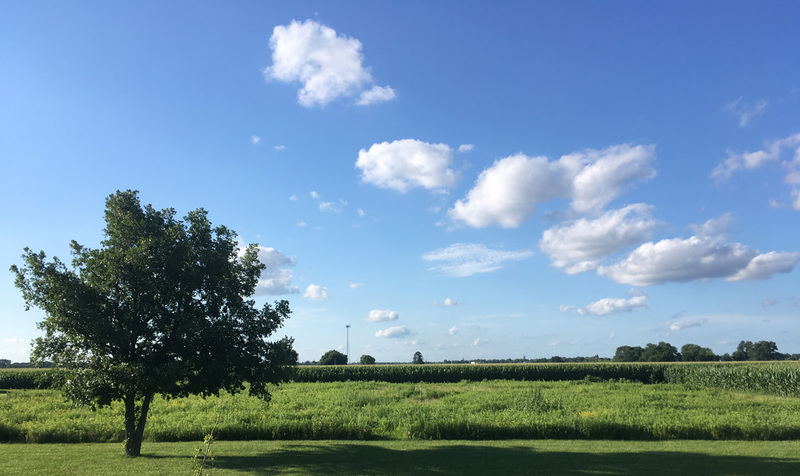 The prairie also provides flowers for the altar, a place for reflection and meditation as well as habitat for insects, animals and birds—habitat that our cultivated landscapes of corn, soybeans and even gardens do not provide. 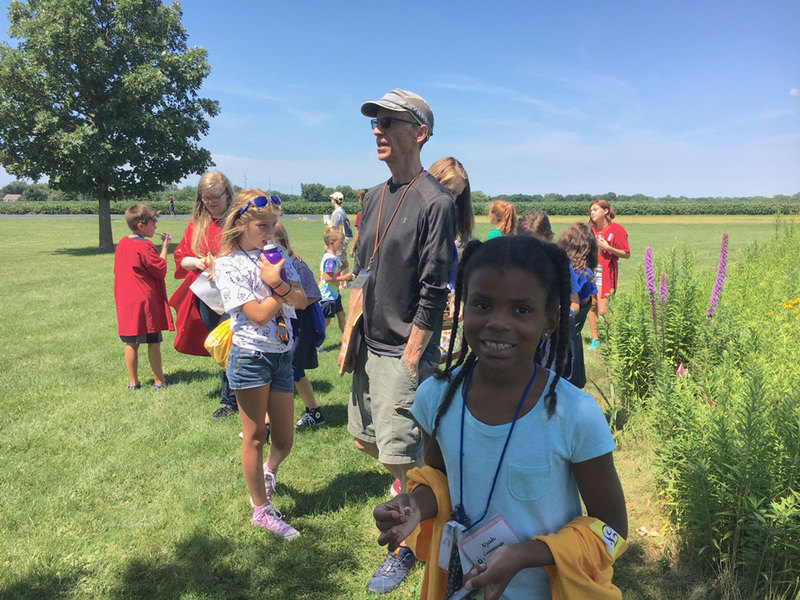 Our prairie will never duplicate the original prairie ecosystem that covered much of Illinois 150 years ago, but it can provide an opportunity for children and adults to observe and learn from the ―Web of Nature‖ espoused in the UU Seven Principles, a web which we celebrate and respect. You have likely noticed the unmowed area in the back corner of the church property with taller grass. This is the site of the “Nature Area” which is the signature project of the Green Sanctuary Committee. 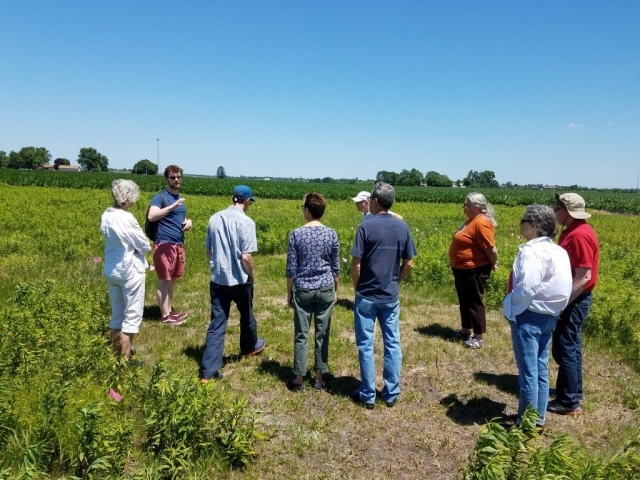 The Illinois Native Plant Society has awarded a $1000 grant to ALUUC toward the establishment of approximately one acre of native prairie vegetation. The unfolding of the Nature Area is a multi-year process which is right on schedule. The area was left unmowed during the summer to keep the grass as tall as possible for a herbicide application, done by a licensed pesticide handler, to knock out the existing grass. 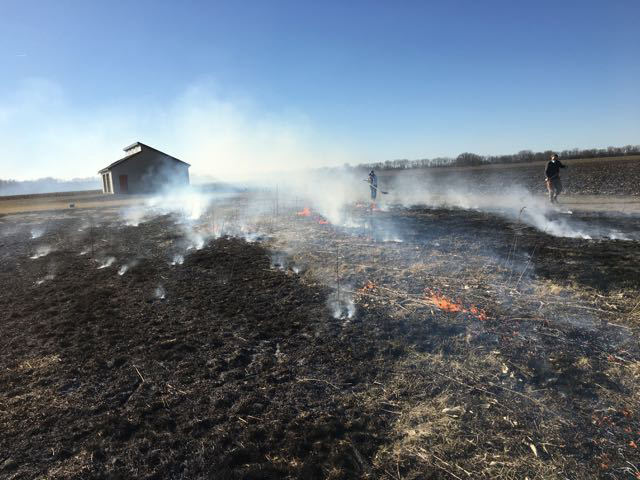 We will conduct a controlled burn and sow the prairie seeds in early December. The prairie plants will sprout next spring and summer. By planting some root stock next Spring, we hope to have a good amount of bloom the first year. Other activities next Spring include spot herbicide of non-native weeds from the seed bank, mowing a few times and hand pulling of weeds. 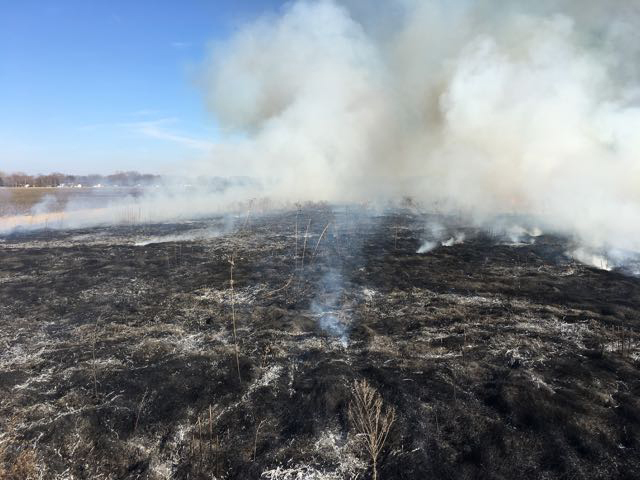 Ongoing maintenance will include controlled prairie burns for the first few years. The Green Sanctuary Committee will keep you informed of progress with the Nature Area and ways to become involved. 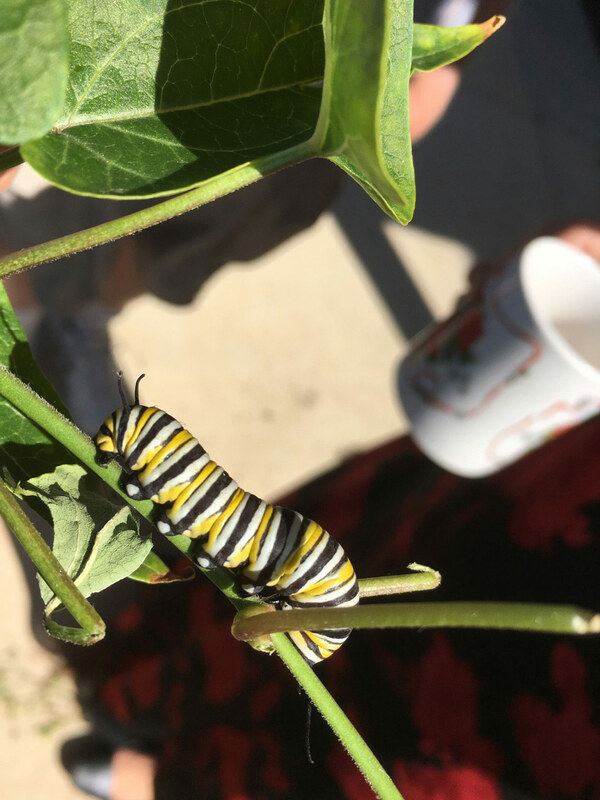 We hope that this work can be a source of personal growth and connection with nature for all involved, especially the youth. The Grant for the Prairie Garden Restoration Project has been approved! Andrew Brunson and Becky Croteau drafted and submitted a grant request to the Illinois Native Plant Society which has been awarded. The Project can now move forward. For our next step, we must destroy life before new life can be sown. The foreign species of plants must be eradicated to make way for the rebirth of native plants which once covered these vast swathes of land. 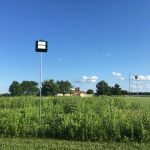 A trained and licensed herbicide applicator will be spraying the north east corner of ALUUC’s grounds to decrease competition from the invasive species currently covering the area. They will spray early in the week so that no children will get the chance to play in it. The area will be marked. This process is the most effective and widely used within the restoration community to clear an area for Native Plants. The herbicide application is done by a professional because there is some hazard involved. There will be another application later in the year and then we will be ready to sow the native seeds, some of which Becky has secured. 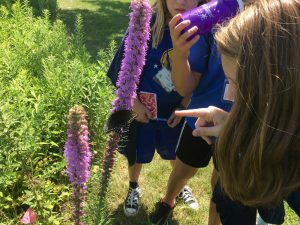 There will be a few seed collecting excursions throughout the summer where we can get folks involved. We are looking forward to including everyone in the planting of the seeds. The sowing process is a great chance to get our hands dirty together. The seeds are considered very precious by those who understand how rare they become with every passing year. Thank you for supporting this meaningful symbol of our beliefs. We will keep everyone posted as the project develops.